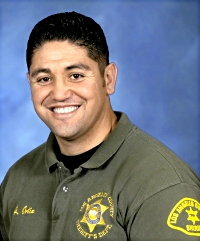 (June 26, 2005) -- Sheriff Deputy Jerry Ortiz, based at the Lakewood Sheriff station, was a Lakewood Award of Valor winner in 2004 for having faced down an armed carjacker who drew a gun on him and his partner, ending with the death of the carjacker and the arrest of two suspected gang members. Dep. Ortiz is the fifth Lakewood Sheriff Deputy slain while on duty...and his name will now be inscribed on the Memorial Wall outside the LASD station on Clark Ave. The City of Lakewood's web site says the November 2004 Award of Valor presentations were attended by roughly 400 people at The Centre at Sycamore Plaza including Lakewood Mayor Todd Rogers, Sheriff Lee Baca, and Deputy Fire Chief Gilbert Herrera. "The Award of Valor is given to deputies, firefighters and paramedics serving Lakewood, whose courageous actions or command of a life-threatening situation are worthy of special commendation," says www.lakewoodcity.org. One day in mid-August, two Lakewood residents found themselves the unfortunate victims of an attempted carjacking near Pioneer and Del Amo Boulevards. Moments later, they flagged down a patrol car, explaining to Deputy Tim Brennan and Deputy Jerry Ortiz how they had been stopped at a light when they were con­fronted by a suspect with an automatic weapon. They'd put their vehicle in reverse and backed up an entire city block before turning it around and locating the deputies. Using the description of the suspect and his getaway vehicle, the deputies began their search, spotting a similar car nearby within minutes. Deputy Ortiz and Deputy Brennan followed the car as it made a series of sudden and erratic movements. The deputies noticed that the three young men inside the car were bending over, as if concealing or retrieving a weapon. 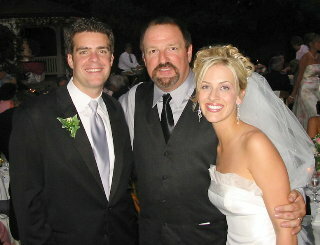 When the car veered toward the curb, one of the passengers exited with a gun and quickly pointed it at Deputy Brennan. Fearing for his partner’s life, Deputy Ortiz fired his duty weapon at the suspect who turned and ran. With houses all around, Deputy Ortiz ordered the man to stop and drop the gun. Ignoring the order, the suspect turned and pointed his weapon at the deputy. Now in fear for his own life, Deputy Ortiz fired at the suspect, fatally striking him. Two suspected gang members were arrested in the incident and a sawed-off .22 caliber rifle was seized from their car. This case led to mul­tiple search warrants and the eventual arrest of an additional suspect in Arizona.